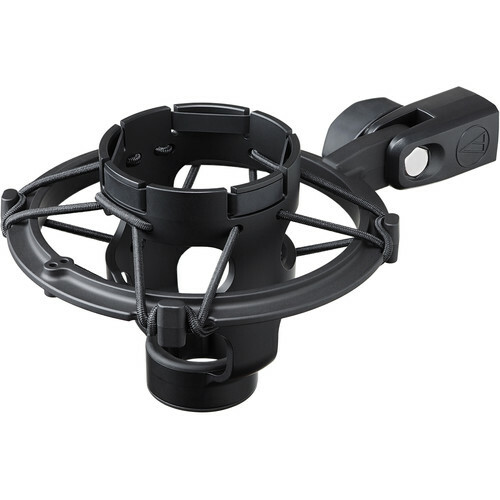 The black Audio-Technica AT8449a is a microphone shockmount designed to safely cradle a compatible microphone in a commercial facility, project studio, rehearsal space, or home setup. The suspension system decouples the microphone from the stand, which reduces unwanted noise and shock caused by contact with the mic stand or vibrations through the floor. The AT8449a was created to hold an AT4033a, AT4040, AT4047MP, AT4050, or AT4050ST microphone. It works with 3/8"-16 and 5/8"-27 threads, making it compatible with most mic stands. Box Dimensions (LxWxH) 6.5 x 5.2 x 4.0"